To Eika on the "Ships starting with E" page. These pictures of Eika and Captain Kristian Klausen were cropped out of an old newspaper article received from Jan-Olof Hendig, Sweden, hence the bad picture quality. 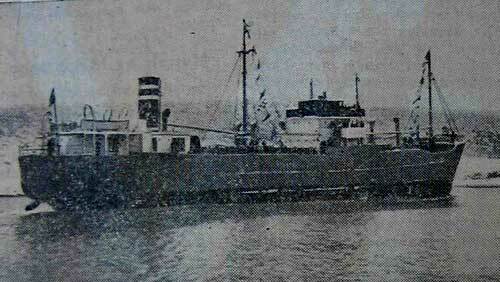 The caption states the picture of Eika was taken during her trials the year before she was sunk. Built by Langesund Mekaniske Verksted, Langesund, Norway in 1939. Torpedoed and sunk by U-51 (Knorr) on Jan. 29-1940 on a voyage from Torrevieja, Spain to Aalesund with a cargo of salt, position 43N 10 35W, 16 died, 2 survived. The 2 survivors were rescued from their raft by the U-boat. Eika had been requisitioned by the Norwegian authorities for the voyage to Spain. J. Rohwer gives the position 50N 10W, while Charles Hocking simply says 200-250 miles off Ushant. In the Norwegian magazine "Krigsseileren", Issue No. 1 for 1973 there's an interview with one of the survivors from D/S Eika, Harald Støle (messboy). 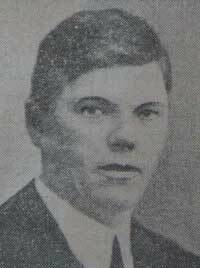 He and his brother Arne Støle were both on board, Arne as a steward. Harald Støle was 16 years old when he joined in the summer of 1939. He says the torpedo hit just after 15:00 while he and a number of his shipmates were in the messroom having coffee. By the time he got out on deck the ship had broken in 2 and sank right underneath him, taking him down with her, but he was able to get to the surface and grab hold of a raft. Stoker Alfred Johansen from Kopervik was with him, but no one else was to be seen. After a couple of hours the U-boat approached, threw them a line and took them on board where they were given dry clothes. He says they were very well treated on the U-boat and were allowed to wander freely, except in the engine room which was off limits. Harald Støle had his 17th birthday on board on Febr. 4 and on this occasion he was called in to the commander who gave him a drink and some chocolate. He says they spent 11 days on the boat and on arrival Willemshaven they were taken to a military place where they were locked in a room. In the subsequent days they were questioned about D/S Eika and her voyage, Støle even had to make a drawing of the ship. After 8 days they were taken to a store where the uniforms they had been given to wear on the U-boat were exchanged with civilian clothing, before they were placed on a train for Hamburg. They were met by the Norwegian consul who saw to it that they were sent home to Norway; by train to Hirtshals, then ferry to Oslo. According to this article the German U-boat commander officially claimed that Eika had used zig-zag maneuvers, had no neutrality markings and had altered course and steered directly towards the U-boat to ram it. He continues: "In order to avoid this attack the steamship was sunk with a torpedo". The Norwegian Dept. of Foreign Affairs also received a note saying: "The circumstances leading to the torpedoing of the steamship Eika is a typical example of what the consequences can be for neutral ships when they do not pay heed to the German Government's repeated warnings against un-neutral or suspicious behaviour". Harald Støle says the ship had large neutrality markings on her sides and the name "Eika - Norge" painted in bold letters, as well as a large Norwegian flag which had a light shining on it during the night. Just a little over a week later this company lost another ship, namely D/S Silja, sistership of Eika, and the Kragerø area alone had thereby lost 23 men. The above was found in "Krigsseileren", Issue No. 1 for 1973, interview with Harald Støle (the names of casualties correspond to the list of missing men given in the newspaper article mentioned in connection with the pictures posted further up on this page). He also mentions a Trygve Bjerka as one of the seamen who went down with the ship, but he's not included in the casualty list (though might be identical to Trygve Kristoffersen). K. Sandaas later had another ship by the name Eika (which Harald Støle joined for a while). Stavern Memnorial commemorations - The memorial for seamen in Stavern, Norway states that the U-boat arrived Bremerhaven with the 2 survivors from Eika on Febr. 14. There are more than 16 names listed here, but please be aware that 13 of them belong to Leikanger. By clicking on each name the name of the ship will come up. Back to Eika on the "Ships starting with E" page. Other ships by this name: Norway had previously had another steamer named Eika, built 1903, 695 gt - disappeared on a voyage from Dunston for Murviken in Febr.-1934 (having left Dunston on Febr. 6). Wreckage, lifebuoys, a lifeboat and the bodies of 2 crew washed ashore on the Norwegian coast, but no news of the ship. There had also been a steamship named Eika II, built 1906, 1268 gt - torpedoed and sunk by a German U-boat in the North Sea on Aug. 19-1917; 1 died out of a crew of 17. This ship is mentioned in a thread on my Ship Forum. This external page has an Eika III, built in 1916, also for K. Sandaas - identical to Sarp. The text on this page was compiled with the help of: "Skip og menn", Birger Dannevig, and misc. sources as named within the text above - ref. My sources.